Gordon Ritchie is wearing a suit. There’s nothing wrong with the suit – it fits well, and given the amount of travelling he’s been doing of late it’s in spectacularly good nick – but there are winemakers who look at home in formal attire and others who don’t, and Ritchie falls into the latter category. Perhaps it’s the hair, shorn rather than styled, or the small silver ring that hoops round his left earlobe, or the fingernails, stripped to the quick, or the thespian tendency that not long ago saw him play the flamboyant emcee in Cabaret at Blenheim’s Boathouse Theatre. Ritchie is chief winemaker at TerraVin, based in New Zealand’s Marlborough region. There’s not a lot of romance in the TerraVin story, in which the lead role appears to have been played by a 15-person syndicate – “a group of globally connected wine friends and pinot enthusiasts”, as they put it – that united investors from Britain, India, Sweden and Taiwan to create “a wine producer with a focus on high end Pinot Noir and the development of a substantial export business”. The focus on high-end pinot noir is clear, the substantial export business is on its way, with the wines previously being available in Britain only at a handful of top-end restaurants but now on general release. He talks a good game, does Ritchie. He doesn’t like the oceans of Marlborough sauvignon blanc whose aromas “leap out of the glass and attack your nostrils”. I’m with him there. He doesn’t like the dark, sweet style of pinot noir that has made Central Otago’s name – “We’re very happy to harvest pinot noir at the early end of its ripeness scale,” he says. “The further you get down that line the further from pinot noirness you get and the further into just red wine.” I’m with him on that one, too. Given their backers’ pursuit of profit, I think it probably took some guts for TerraVin – a decision that possible predates Ritchie’s arrival in 2010 – to turn their back on New Zealand’s most internationally successful styles of both white and red wine. One of the investors, though, tells me his focus is “quality, not compromise”, and TerraVin of course are not alone in trying to take the common-or-garden Marlborough savvy in a new direction. Ritchie uses wild yeasts, and ages 20% of his basic bottling in barrels: “We make a rod for our own backs doing that, but we achieve a style we enjoy”. There’s also the Te Ahu, which is entirely aged in large oak barrels for between 12 and 18 months. “What we’re trying to do is take a variety we know and love and see what we can take it to,” he says. “If someone bought this wine expecting a Marlborough sauvignon blanc they would probably be quite surprised.” I like the cheaper sauvignon, but find that the Te Ahu triggers an extremely specific childhood taste memory. And I don’t necessarily want my white wines to make me think of myself, as a shorts-wearing juvenile CF, eating a particular but now-forgotten brand of highly-processed soft cheese. He hasn’t messed up. 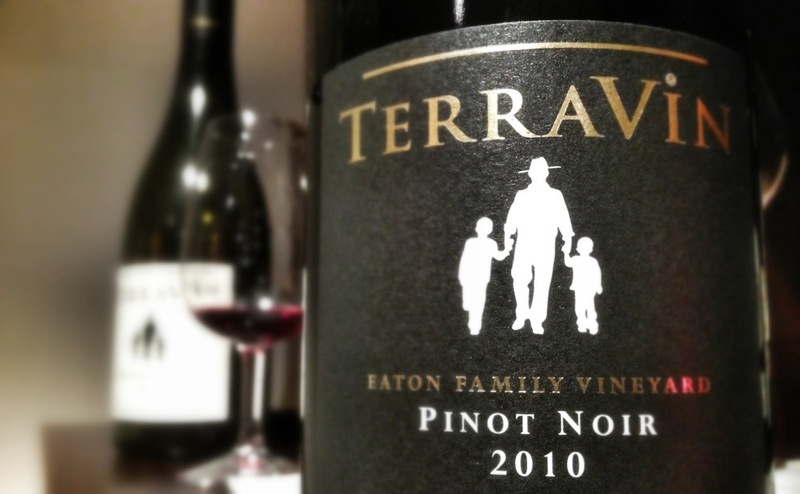 TerraVin’s current pinot noir releases are both excellent, with the cheaper of them – which costs £19.50 from The Wine Society and a bit more elsewhere – a lovely, fresh wine of clear quality. “It’s not a huge, muscular sort of wine and I’m happy with that,” he says. “That sort of wine is not what we’re trying to make.” It comes strongly recommended. There’s more depth in the 2010 Eaton Family Vineyard, a year older, and treated with more new oak – “The fruit is overall a little more intense in its character,” says Ritchie. At £39, again from The Wine Society, it goes down on the regrettably lengthy list of wines that are too expensive for me to enjoy again (though it may be available for less from the importers, Clark Foyster). There was also an appealing chardonnay, though I can’t find anyone selling it in the UK. It was an impressive line-up, from a producer whose newly-expanded availability in the UK is most welcome. Or, as Ritchie might say, while caked in make-up and twirling a cane, willkommen, bienvenue, welcome. This is the first time I’ve ever heard of someone saying that PN is not a diva. Great article. Your writing is an absolute pleasure to read. I know! And you’re most kind. Cheers.